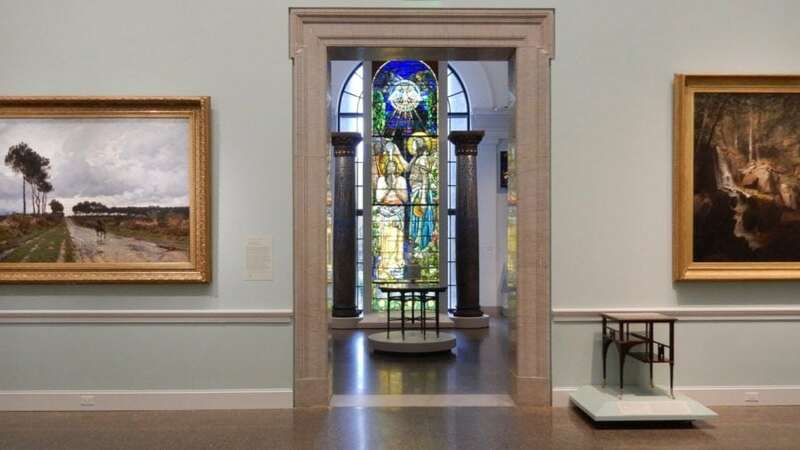 WHY GO: Incredibly, Baltimore has two majestic, World Class encyclopedic art museums, the Baltimore Museum of Art and The Walters Art Museum, and even more incredibly, both are free to visit. As a departure from spotlighting the typical “Inner Harbor” attractions, this Getaway focuses on the artsy institutions and neighborhoods that make Baltimore so compelling and fun – from the most outrageous art museum in the country, to the streets where filmmaker John Waters lives, with countless independent shops, trippy art, and a renovated hotel worth a second look. Combine this with our Historical Visit to Baltimore, and you’ve got yourself a week’s worth of exploring to do. VISIT: American Visionary Art Museum. Students, laborers, dyslexics, misfits, recluses, mental health patients – and the rest of the unwashed, self-taught intuitive artists ignored by mainstream art world have finally found recognition at this unbelievably eccentric museum. My absolute favorite institution in Baltimore, The American Visionary Art Museum is filled with works produced from found objects, matchsticks, bottle caps, yarn, and lots of what other people would call “junk” in galleries teaming with madcap creations. War, workers, whackos, technology, terror, tchothkes; all here in this highly entertaining fun house of an art museum. Plus, the storage-shed of a gift shop will consume your attention for hours. $16 adults, $10 children/students. Tues-Sun 10-6. VISIT: Baltimore Museum of Art. Modeled after the Neo-Classic Metropolitan Museum of Art in New York and Museum of Fine Arts Boston, the BMA, abutting the Johns Hopkins University campus, is another powerhouse in the art world. Among its massive holdings of mid-century modern and 20th century Colorists, BMA boasts the world’s largest collection (over 1,000) of the works of Henri Mattise. The BMA is, by all measures, a stunning place – made even more interesting by juxtaposing the contemporary with the classic – as it does in the great entry hall illuminated by a thicket of hanging lights. Anchored by the Cone Collection of modern art, which includes Matisse, Picasso, and Cezanne among many others, the BMA is also known for its prints, drawings, photographs, textiles, and English Sporting Art. The cement-silo Contemporary Art wing is as much a work of art as any strange and mystifying installation within its curvy walls. On any given day, the BMA thrums with activity. Open Wed-Sun 10 – 5, free. VISIT: The Walters Art Museum in the Mount Vernon Cultural District. What makes the Walters Art Museum so compelling, besides its grandeur (and the fact that admission is always FREE) is that it began in the home of railway and steamship mogul, William Walters, who, in the mid 1800’s, had a thing for European Art and Chinese Snuff bottles. William’s son, Henry, inherited and then rounded out his father’s collection with objects from World’s Fairs and other art that only vast amounts of money could buy. When Henry Walters died childless in 1931, he bequeathed 22,000 works of art, along with funds to build a grand Italian marble Palazzo-style museum, to the city of Baltimore. The result is a crazy quilt of an institution encompassing airplane-hanger sized arched Victorian galleries and a separate renovated mansion adorned with clever contemporary art. Start on the 4th floor to see William Walter’s original collection. You’ll find all the greats in Impressionist Art – Monet, Manet, Pissaro, etc. – presumably purchased “when wet” by the older Walters. On lower floors, find Religious art, portraiture, 17th century Italian, Spanish, French, Islamic, Medieval, Iconic, Buddhist, and more. Do not leave before visiting the new addition called “1West” – the renovated Hackerman mansion – subsumed by the Walters Museum and connected to it in a convoluted way. Ask museum staff to direct you – it’s definitely worth locating. The historic home’s piece de resistance is its grand spiral staircase crowned with a Tiffany glass dome. Climb up and you’ll be rewarded with a fantastic ceramics exhibit (my favorite, the Laughing Buddha), and other contemporary installations in an unlikely setting. Open Wed-Sun 10-5, Thursdays until 9pm, free. STOP IN: George Peabody Library, at Johns Hopkins University. You’ll find this impressive place steps from the Washington Monument in the Mount Vernon District. With a Visitor’s Center that features rotating exhibits, from rare books to ancient maps (when I stopped in, there was an original copy of the 1845 Narrative of the Life of Frederick Douglas, An American Slave, a 1533 Math Manual, among others), the main event is the gorgeous library room itself. Step across the threshold, breath it in, take a snap, and shhhhh. Let the students work. Treason Toting Company, owned by Baltimore born and raised Aaron Jones and Jason Bass, recently moved to Mount Vernon from Fell’s Point. You’ll find the sturdiest of hand-made canvas backpacks with lifetime guarantees ($190-$450), hats ($40), sweatshirts ($30), and other Baltimore-made items. Jones and Bass plan to host book signings and hope to become a resource for others in the community. Keeper’s Vintage and Knits, Soy, and Metal. Erica Bentley (Vintage) and Letta Moore (Knits) own side by side shops with two distinct themes. Find designer vintage clothing in one – and make or buy soy candles and purchase hand made items, like floral-scented natural deodorant, in the other. Both support local artists and pop-ups, so you’ll always find something unique here. Atomic Books – for out of the norm publications. TROHV – funky-rustic accoutrements for hipster households. Ma Petite Shoe – a shoe and chocolate boutique. If you don’t buy in one category, you’ll definitely walk out with the other. EXPLORE/SHOP: Fells Point. The narrow cobblestone streets and Federalist townhomes are reminiscent of a much smaller colonial town, so it’s no surprise that tourists are drawn here for myriad boutique shops, historic pubs and the latest sensation – the Sagamore Pendry– a swank hotel situated on the 1914 Recreational Pier. Of course, we’ve got our favorites – so stop in to the following indie stores for unique gifts and a friendly experience. Emporium Collagia. Luana Kaufmann is a collage artist, and of course you can purchase her intricate conversation pieces here. But she also curates a “collage of stuff” within a view of the harbor. Find funky jewelry, house-wares, prints, and mysterious “levitating stone worlds” (from $125-$280). Emporium Collagia is a world unto itself, and you can definitely get lost in it. Sheep’s Clothing. On a side street off the beaten track, visitors and locals have been finding this lovingly stocked gift and clothing store, owned by Charles and Darcy Norton, for 39 years,. The very upbeat Darcy has an apparent blast “putting things together.” So, you’ll find woolens, leather goods, hats, caps, knitted kids sweaters, jewelry, trivets, cotton, silk and linen scarves, and even stationary at reasonable prices. Clueless though you may be when it comes to finding that perfect present, you will definitely purchase the proper one after consulting Darcy – the queen of thoughtful gift ideas. More great stores include Hats in the Belfry (all manner of chapeaus), Greedy Reads (fantastic new indie bookstore), and The Sound Garden (for all your vinyl recordings). EAT: R House. A “launch pad for Baltimore’s most exciting chefs,” in the up and coming Remington Neighborhood, this 10-eatery-plus-bar food court is one of the hippest spots in Baltimore at the moment. Like any upscale Food Hall worth its stars, this one offers trends that foodies love: poke bowls, vegan, Arapas, Pizza, Mediterranean, tacos, and more. It’s a veritable United Nations of affordable bites, and a fun way to dine. EAT: The Papermoon Diner. Imagine that the characters in Toy Story – in all their candy colored glory – mutated and regenerated exponentially like Tribbles then marched into a restaurant and took residence on the walls, and you’ll have a good idea of what this iconic Remington Neighborhood eatery is like inside. To see it all, plan breakfast or a comfort food meal here – and prepare to be fantastically distracted. EAT: Bird In Hand, adjacent to Johns Hopkins U. From the chef that brought you Woodbury Kitchen – Spike Gjerde – comes this student-friendly Café in partnership with the Ivy Bookstore. Gjerde sources every ingredient from the Mid-Atlantic region and his efforts in sustainability go beyond most chefs – to the point where, because olives don’t grow here, he does not use olive oil in his recipes, and must “get creative.” Come in for Trout Toast ($7), Deviled Eggs ($4), Sautéed Greens ($8), Tofu Banh Mi ($11), or other healthy breakfast or lunch items. An ersatz college workspace, you won’t be out of place if you bring your laptop. EAT: Dooby’s. In the Mount Vernon section of Baltimore, this Asian-flair fast “slow food” eatery is very popular for quick meetings and take-your-time gatherings. Order the likes of Korean BBQ Hot Wings, Veggie or Pork Dumplings, or other trendy vittles at the counter, take a number, and your food is brought right to your table. Easy peasy. And yummy. EAT: The Food Market, Hampden Neighborhood. Set inside a renovated old food market in filmmaker John Water’s old stomping grounds, amiable owners Elan Kotz and Chef Chad Gauss have a hit on their hands. The menu is a witty mix of comfort foods, molecular gastronomy and unusual combinations of flavors, divided into “Little,” “Small,” “Big” and “In Between” categories. Try the Amish Pretzels with Beer Cheese Fondue $7, Fried Gorgonzola Pickles $7 (sounds gross, but it’s really amazing), Salt and Pepper Tuna with Avocado Tzatziki ($13), Grilled Lamb Porterhouse with espresso, apricots and limoncello glaze ($14) and a heady Heath Bar Crunch Bread Pudding. The Food Market elevates grazing to high art, compelling you to return to try everything you missed. STAY: Royal Sonesta Harbor Court Baltimore. In all the frenzy about the new boutique hotels cropping up around town, some might forget that there are others in Baltimore, grand in their day, newly renovated, that have stood the test of time. One is the understated Royal Sonesta Baltimore, fresh from a $11 million restoration and right across the street from the Baltimore Science Center. What sets Baltimore’s Royal Sonesta apart is its roof-top tennis court, large indoor pool, and views (from select rooms) onto the Inner Harbor and its most lauded museums. Recently refreshed in shades of sand and earth, with grass cloth wallpaper, white tucked-in comforters, raindrop-shaped glass nightstand lamps, light-filed marble bathrooms, and modern furniture that doesn’t scream high-style, rooms at the Royal Sonesta Harbor Court give off a vibe of hushed elegance. Ask for a larger room overlooking the harbor that sports bay windows, eggplant colored window seats, and sheer curtains that, when closed, create a cocoon-escape from Baltimore’s Inner Harbor happenings. Indoor swimming pool with lap lane. Room and suite rates from $150-$430 per night.